William Dávila wasn’t looking to leave Springfield’s Gandara Center. In fact, he was quite happy in his role as director of Outpatient Services for the facility, which provides mental-health, substance-abuse, and preventive services for children, adults, and families across Western Mass. 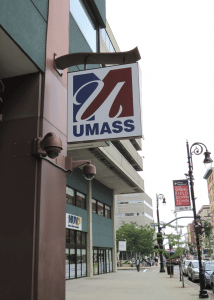 But when he was informed that UMass Amherst was looking for someone to manage the center it was building within Tower Square in downtown Springfield, he saw an opportunity he couldn’t resist. 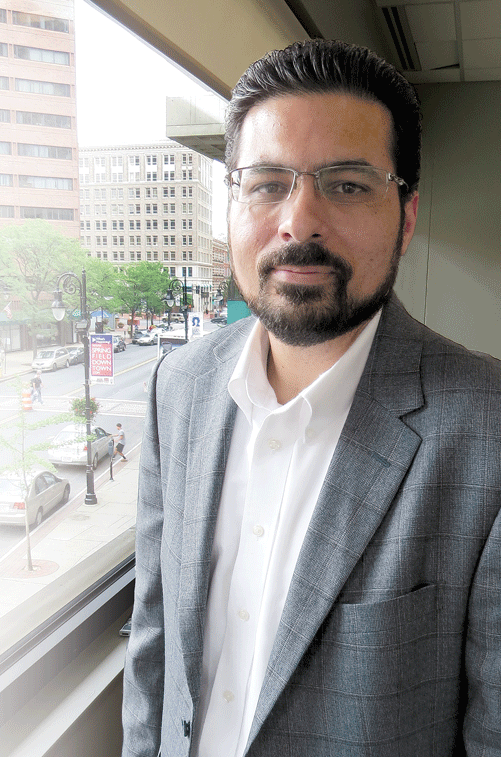 Dávila, a member of BusinessWest’s 40 Under Forty class of 2013, eventually prevailed in an extensive search for the center’s director of Operations, and is now in a highly visible position with a clearly stated but multi-faceted job description — to make the broad vision for the UMass Center at Springfield become reality. And that vision goes well beyond the actual 26,000-square-foot facility, which makes extensive use of glass and prompted Dávila to wear out the phrase ‘state of the art’ as he described it. Indeed, there are expectations that the center will be a catalyst for change and help bring a renewed sense of vibrancy downtown. In short, this is being viewed as an economic-development initiative as much as it is an educational facility. And it will likely be both, said Dávila, adding quickly that, for now, the task at hand is to get the doors opened as scheduled on Sept. 2. All appears to be on track, he said while offering a tour of the facility — something he’s done quite often over the past several weeks — adding that UMass has moved quickly and purposefully in building the center, which will open less than 10 months after it was announced at an elaborate press conference at Tower Square. More than 30 traditional and online courses will be offered through the center this fall, with titles ranging from “Gambling, the Hidden Addiction,” part of the curriculum for the Addiction Counselor Education program at UMass Boston, to “Introduction to Urban Education,” one of the offerings for Education students at UMass Amherst, to “Advanced Pathophysiology,” part of the Nursing program at UMass Amherst. Dávila expects between 200 and 300 students, faculty, and staff to take part in programs at the center. In time, he believes, those numbers will escalate as people come to understand all that the facility has to offer and realize what an attractive learning environment has been created. For this issue, BusinessWest goes behind the scenes at the emerging UMass Center at Springfield to gain some perspective on the operation as well as the hopes and expectations of the individual chosen to manage it. 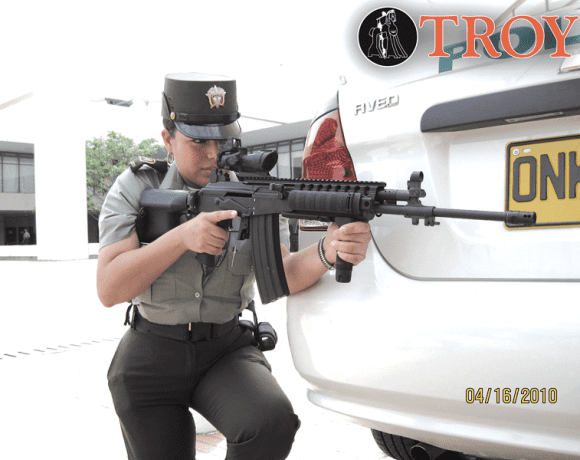 When asked when he started in his new position, Dávila had to think for a few minutes, and eventually had to summon his phone to pinpoint the date. By that, he meant everything from the work to build out the space, some of which looks out on Main Street, to meetings with a host of constituencies, including UMass Amherst Chancellor Kumble Subbaswamy, Springfield officials, and members of the business community, to giving those aforementioned tours, which are more detailed now than they were a few weeks ago because there is much more to see. An architect’s rendering of the main entrance to the UMass Center at Springfield. Several large classrooms, which can accommodate more than 30 students, are taking shape, as are two patient-simulation areas that will be used for nursing courses and other healthcare offerings and are expected to be among the main draws at the center. Meanwhile, two large student lounges, each making extensive use of natural light through huge windows, are receiving their final touches, as is the welcome center. “It’s fascinating to see it all come together,” said Dávila, who brings a diverse background to his latest assignment, with a résumé that features work in higher education, social services, and nonprofits. One of his first professional stops was with Project Hope of Merrimack Valley Catholic Charities, which he served as program director. That was followed by two assignments in higher education — first as assistant director of Graduate Admissions at Lesley University in Boston and then as coordinator of Personal & Academic Support Programs at Boston University. He then switched gears and became Metro Boston regional manager for the Devereux Foundation, a national behavioral healthcare provider. That was followed by a stint as West Roxbury program manager for the MENTOR Network and then a five-year stop as deputy director of the Children’s Study Home in Springfield, before coming to the Gandara Center in 2011. Dávila will put experiences at those various stops to good use while meeting what he said is an intriguing job description for the UMass Center’s director of operations. “It’s kind of interesting — the job description is a combination of a community-relations person, an operations person, and some admissions as well,” he explained. “It’s a combination of all those things. I’ll be functioning as a recruiter, but I’ll definitely be looking for opportunities to connect prospective students with some of our different departments and making sure that I’m creating some opportunities for us to reach out to students. In the short term, as he said, the primary assignment is to coordinate a smooth launch for the center, which will be a closely watched initiative given the lofty expectations and the considerable hype that accompanied the university’s long-discussed plans to heighten its presence in Springfield exponentially. Long-term, though, he said he will be tasked with gauging and then meeting community needs. 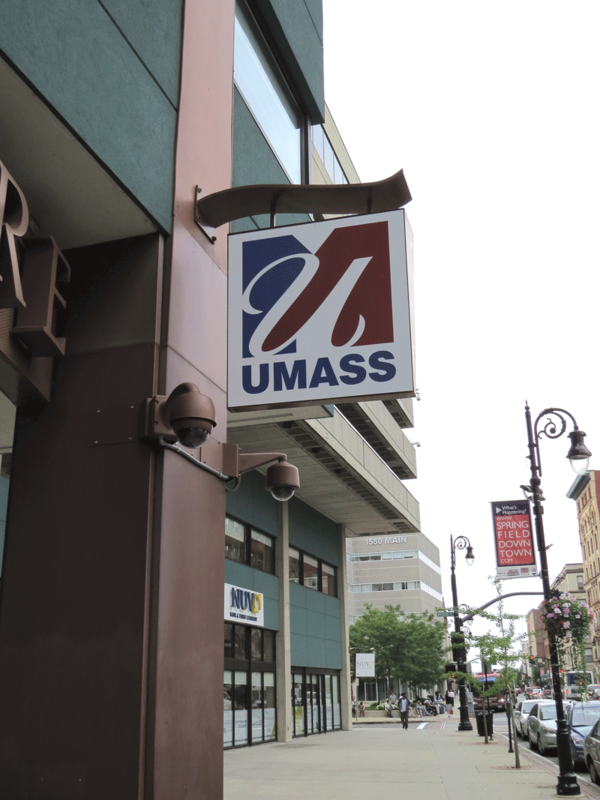 A new sign on the east side of Tower Square announces the arrival of UMass. The lineup of graduate and undergraduate courses for this fall was assembled in response to stated community needs, Dávila went on, adding that the offerings cover a number of degree programs, from nursing and addiction treatment to education and business. There are also a few classes offered through the school’s University Without Walls program for non-traditional students, many of whom are already in the workforce, as well as some non-credit training programs. The biggest block of classes, however, is in nursing. Overall, there will be eight offerings, including “Pathophysiology” and “Advanced Pathophysiology,” “Community Focus in Nursing,” and “Cultural Diversity in Health and Illness,” he said, adding that the state-of-the-art simulation areas make the Springfield center a unique learning facility. And its location should be an asset, not a hindrance, he went on, noting that, while downtown Springfield presents some challenges, the center offers 24/7 security, plenty of attached parking, the latest educational technology, a unique space, and scheduling that is conducive to working professionals as well as traditional students. Making prospective students aware of all this is one of the more critical aspects of that aforementioned job description, said Dávila, adding that he and others are getting the word out through traditional advertising, social media, and networking. These efforts have yielded enrollment figures that are solid and consistent with unofficial goals. But numbers, while important, are not the primary objective at this early stage, he went on, noting that more critical is the work to lay a solid foundation and then build on it through efforts to collaborate with other schools and the community at large to ensure that the center becomes what it was a designed to be — a multi-faceted resource. He acknowledged that there are those at Greater Springfield-based colleges and universities who might consider the UMass center to be competition for them, but added that, thus far, other schools are indicating a desire to partner with the facility, not reject or fear it. “I’ve been approached by other institutions about working together,” he told BusinessWest. “I’m sure there are some folks who are looking at us as competition, but others see that there are opportunities here; we can do degree programs, we can do transfer programs … there are opportunities here to do different things, and I know the faculty that’s already associated with us has expressed interest in that. When asked how success would be measured at UMass Center Springfield, Dávila said the answer to that query will change over time. After that, success will be a function of connecting students to the courses, he went on, emphasizing that, while enrollment numbers are not critical at this stage, they will become paramount in the years to come as the center seeks to continually grow its operations. But, overall, success will be measured by how well the center can connect with the community and become a vital resource, he said, noting that this first year will be an important one for not just establishing a presence, but making sure that presence is felt.